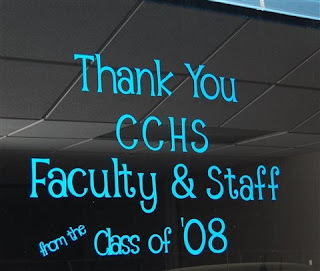 I helped a friend do a bit of decorating for the traditional senior class Faculty and Staff Appreciation Luncheon at our high school. I used Wall Pops and the Alphalicious font at six inches for most of the words. I welded the "Class of" at a four inch size and also welded the "from the" at a 2 inch size. The apostrophe for the "'08" is actually the top part of the exclamation point sized to look proportional. I had the electric blue wall pops that had been on special at Lowes on hand and by using the Design Studio software I was able to fit the letters together and use only 8 feet of the 6 1/2 inch roll so this was a very economical project. I wasn't sure about the color since the theme was a sort of western picnic but we found that it was almost and exact match for the blinds in that room - a bit of serendipity! So glad to see what you have done with the vinyl, as I am just getting started with it. I have red and yellow, and might do the same (anonymously) for the staff at the school where I substitute teach. It looks great on the glass. Thanks for the ideas, as always! Love it! I'm sure the students and teachers did as well. Just as an FYI, there is an apostrophe in Alphalicious. If you shift in DS, it's in the space where the 9 was before shifting. Thanks Jennifer - I did see the symbol on the shift of 9 but I thought it was a comma (I guess they are pretty similar). I think the top of the exclamation point works here but I appreciate you attention to detail! It was by playing with all the shift keys that I found the item that I used to create welds in circles! How cool is that! You should enter this in The Great American Vinyl Contest. Sign up is at www.PrintOnIt.com.